When it comes to office ergonomics, small adjustments can make a world of a difference. Do you often feel fatigued at work, have trouble focusing, or suffer from different aches and pains, whether it’s your neck, shoulders, back, or fingers? While there may be multiple causes to your issues, one of them most likely is poor office ergonomics. Office Ergonomics refers to the optimization of your office environment for better health, comfort, and productivity. 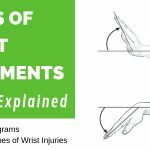 Everything from the way you sit, placement of equipment and how you interact with them, to your daily work routine is involved. As mentioned, small tweaks in each of these areas can yield tremendous benefits. 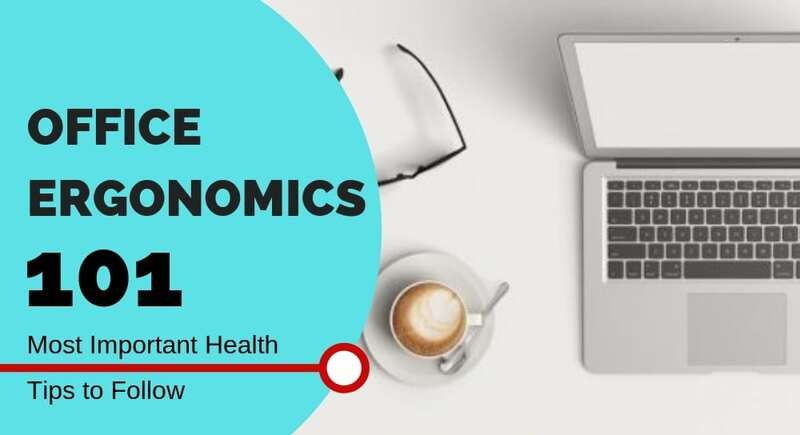 In this article we look at the most important ergonomic changes you should make today in your office and your work routine to start working more healthily and with increased productivity. 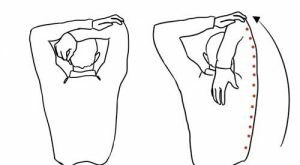 This is an awesome stretch to release tension from all areas of your upper body, from your neck, shoulders, to upper back, all in one go. 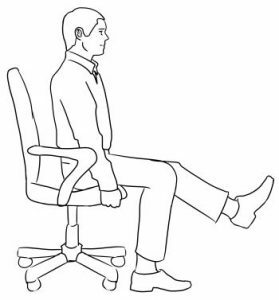 The above are just two of a myriad of office stretches you can do. Try to incorporate at least one stretch for each part of your body. If you don’t have enough time to exercise in front of your desk (or feel silly doing so), find a good reason to get up from your desk and just yawn, stretch, or flex every 30 minutes. Simply changing postures brings blood flow to areas of your body that was were previously stagnant. 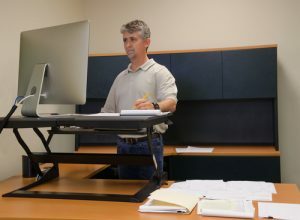 Some office workers try to evade the risks of prolonged sitting by using standing desks. But even standing for too long has its own health risks. A recent study found that standing for too long doubles one’s risk of cardiovascular disease. I know right? So if sitting for too long turns you into a bedridden geriatric while standing for too long jeopardizes your heart health, what is an office worker supposed to do? The new guidelines depart greatly from older studies that typically recommends people stand for far less time compared to sitting. If you have a desk job, looking at screens is typically inevitable. Regardless of what position you hold or how many digits are in your paycheck, using laptops and smartphones is the new norm. Unfortunately, our eyes aren’t evolutionary structured to handle the blue light that screens emit. As a result, staring at screens for too long can damage the eye cells. 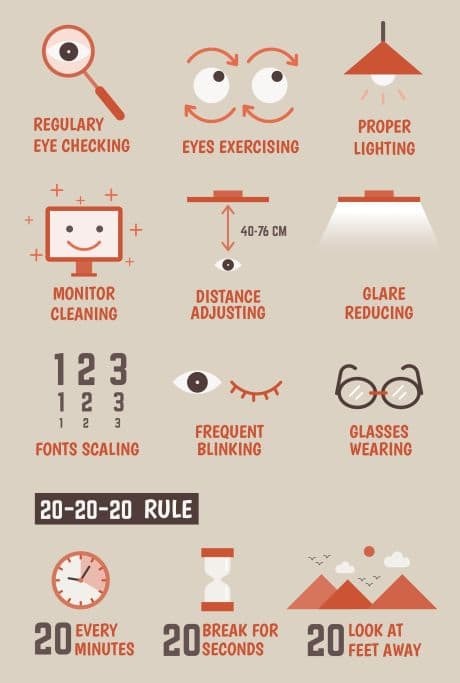 If you’re always staring at a screen, your optician may have recommended the 20-20-20 rule. Basically, this means that for every 20 minutes you spend gazing at a screen, you should look away at an object that is 20 feet away for a minimum of 20 seconds. Here is a good online tool to remind you to do just that every 20 minutes. Does that mean you should carry a tape measure to your office every day? Not necessarily; being exact isn’t the point. What you need to do is to focus on anything far away enough. Why 20 seconds? This is because your eyes take about 20 seconds to relax. Harvard Medical recommends the use of anti-blue light glasses as well to block the harmful effects of blue light that computer screens and smartphones emit. The side effects of over exposure to blue light are many, from eye strain, disruption to your sleep, to even macular degeneration that can eventually lead to blindness. Sit an arm’s length away. 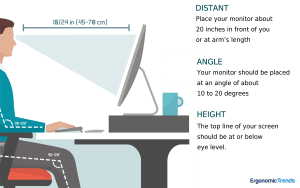 Your monitor should be at a reasonable distance away from you, enabling you to view the whole screen without twisting your head or neck. Ideally, your monitor should be 20 inches from your eyes. You should position the top of your screen so that it’s level with your eyes. Essentially, your eyes should align with an imaginary line across the screen. Beware of windows. If your office has windows, then you should be cautious of the reflections/glare that crop up on your monitor, and cause you to squint. To reduce this glare, position your monitor perpendicularly to your window. Balance the brightness of your monitor based on your surroundings. When typing, your forearms should be relaxed, with your elbows adopting an open angle of 100 -110 degrees. 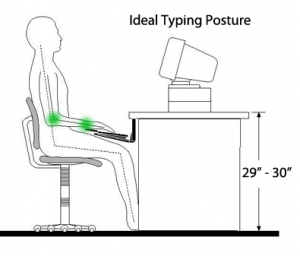 Keyboard should be positioned below your elbow and sloping downwards. 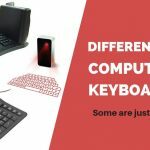 Use an ergonomic keyboard with a negative tilt or a keyboard tray to easily position the keyboard so it’s sloping downwards and not upwards like many conventional keyboards. 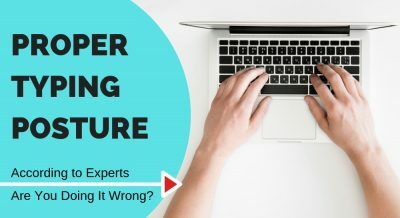 You should place your mouse so that it’s close to your keyboard. Hold your mouse loosely. 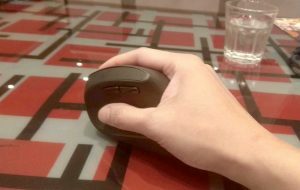 In the same way that typing too hard on your keyboard causes pain, holding your mouse tightly causes a similar effect. No need to choke your mouse! 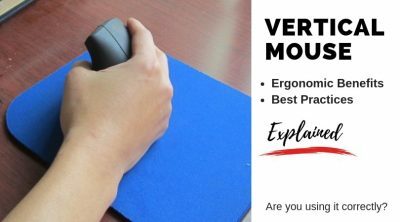 For people with wrist pain, a vertical mouse or trackball has many benefits worth looking into, such as reducing the pronation of the forearms when operating them to minimize CTS and other RSI injuries. 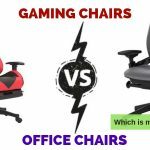 As for your desk, you should choose one that provides enough room for your knees, thighs and feet. Organize your workstation into zones, where the items you access the most often are within closest reach. Keep items that distract away from you, such as your cell phone. 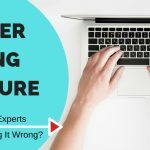 Even if you’ve invested in an ergonomic chair, you might still wind up in pain if you don’t maintain the correct sitting posture. For starters, you should remove your wallet, keys and phone from your back pocket before sitting down. These items tend to put extra pressure on your glutes. Don’t sit in the same position for more than half an hour. Stand up, move around often. 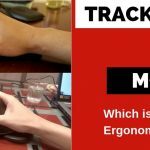 One of the most overlooked aspects of office ergonomics is workplace setting. The lighting, temperature, and in door air quality are equally important factors to consider. The US General Services Administration (GSA) requires that every work environment have a specific amount of light. More specifically, the office lighting standards are set at 500 lumens per square meter. This means that for a 6’ by 6’ cubicle, you’d need a lighting fixture that provides the same amount of light as a 35-watt incandescent bulb. Setting the temperature and humidity can be challenging since every worker will have his or her own preference. So the best thing to do is to choose settings that are comfortable for as many people as possible. Indoor air pollution is an increasing concern in today’s workplace. The age of your office building, the materials used, plus mold build up can all lead to health issues from mild to severe. According to experts, they can range from “coughing to exacerbation of chronic respiratory disorders such as asthma and outcomes such as cardiovascular disease and even cancer.” Consider investing in a good air purifier with HEPA filter to effectively clean the air and remove common household pollutants like pollen, pet dander and dust mites. Every company, regardless of its size or nature of operations, ought to create an ergonomically sound work setting for its employees. But no matter how well a firm designs its workspace, it’s ultimately up to you ensure that good ergonomic practices are followed. As a freelancer, we must take on this responsibility ourselves to ensure our work isn’t slowly killing us. All the fancy ergonomic desks and tools are not going to help if a worker is always slouching awkwardly at their desk. That 20-20-20 rule is pretty cool! I usually try aiming for a few minutes breaks every hour or so. But maybe I should add in some “microbreaks” of 20 seconds as well.